Description: Dead noon- high sun- who cares? It's an Alligator! UTAH RR 402 dozes at Provo in the summer of 1976. Description: HIAWATHA UT Aug 22 1981 -- Utah Railway RSD15 402 and two sisters smoke it up as they begin to pull on a cut of cars at the Hiwatha loudout. Trailing unit 403 belches the most smoke and puts much of the area in shadow. The sound was incredible. According to utahrails.net alligator 402 was built for the Santa Fe in May 1960 as no. 9839. It made its way via Precision National in Illinois to the Utah Railway as no. 402 on Oct. 28, 1975. It was placed in service on Oct. 31, 1975. Its last day of service on the Utah was May 13, 1982. It was retired May 14, 1982 and sold for scrap in November 1983 to Industrial Salvage & Metals (Salt Lake City UT) where it was scrapped in early January 1984. Description: MARTIN UT Oct 5 1978 -- Utah Railway RSD15 403 awaits its next assignment at the engine facility in Price. 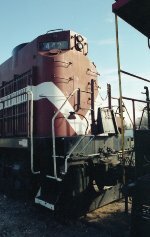 Information taken from utahrails.net indicates unit 403 was built as ATSF 9847 in June 1960. It was sold to Utah Railway on Oct. 28 1975 and was retired May 14 1982. It was sold for scrap in November 1983 to Industrial Salvage & Metals (Salt Lake City UT). It was scrapped in early January 1984. Description: HIAWATHA UT Aug 22 1981 -- Utah Railway RSD15 403 Leads a train into Hiawatha UT. 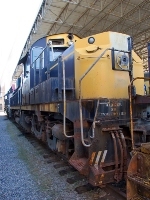 According to utahrails.net alligator 403 was built for the Santa Fe in June 1960 as no. 9847. It made its way via Precision National in Illinois to the Utah Railway as no. 403 on Oct. 28, 1975. It was placed in service on Oct. 31, 1975. Its last day of service on the Utah was May 13, 1982. It was retired May 14, 1982 and sold for scrap in November 1983 to Industrial Salvage & Metals (Salt Lake City UT) where it was scrapped in early January 1984. Description: MOHRLAND UT Aug 22 1981 -- Utah Railway RSD15 403 and two sisters, all in faded Santa Fe paint, smoke as they begin to pull on a cut of cars at the Mohrland Loadout. According to utahrails.net alligator 403 was built for the Santa Fe in May 1960 as no. 9847. It made its way via Precision National in Illinois to the Utah Railway as no. 402 on Oct. 28, 1975. It was placed in service on Oct. 31, 1975. Its last day of service on the Utah was May 13, 1982. It was retired May 14, 1982 and sold for scrap in November 1983 to Industrial Salvage & Metals (Salt Lake City UT) where it was scrapped in early January 1984. Description: Defiance yard. Date is approximate.